At this global bank, diversity is an opportunity – for their clients, thier employees and the firm. By valuing diverse perspectives, they can better serve their clients while they help employees achieve their professional objectives. A corporate culture that is open and inclusive is fundamental to their role as a global leader constantly striving for excellence in all that they do. They have asked us to help the find female candidates for the role of Fixed Income Compliance Officer. The individual will provide coverage support in providing primary compliance advice to the FX and Emerging Markets, Commodities and Structured Rates business unit within the Fixed Income and Commodities Division reporting to an Executive Director within the Fixed Income and Commodities Compliance advisory team. The role will include assisting with transactional queries, new products and rule and policy interpretation. The individual will also assist with developing and delivering compliance training, developing, reviewing and producing compliance policies and procedures and assisting in enhancing and developing the monitoring and desk review programme. 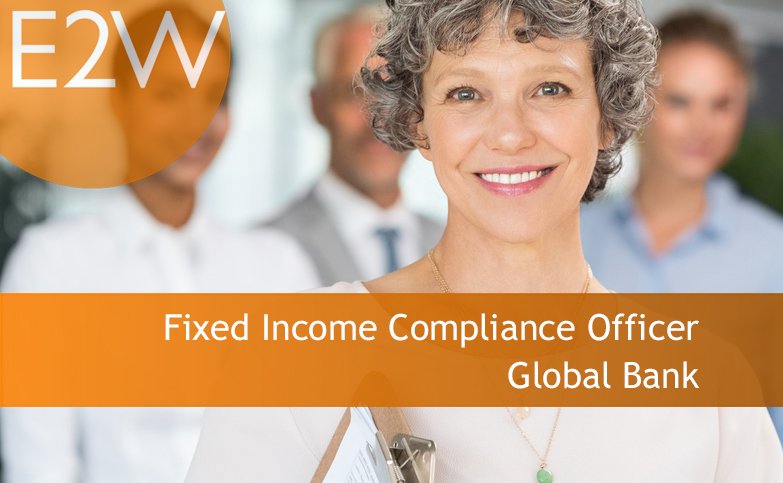 Provide oral and written general compliance and transactional advice to the FX & Emerging Markets, Commodities and Structured Rates Business Units on compliance policies and procedures and relevant UK laws, rules and regulations. Provide support for the Compliance participation in the New Product Approval process for the relevant business areas, assisting with providing the compliance advice on transactions. Engage with individuals across the FX & Emerging Markets, Commodities and Structured Rates Business Units providing them with regulatory advice, appropriate management information and compliance support with respect to the regulatory aspects of the business they operate. Assist in the development and implementation of new policies and procedures or, as appropriate, the update of existing policies and procedures in response to, or in anticipation of, relevant rule changes and new legislation and industry guidance. Participate in strategic projects and initiatives with other legal and compliance professionals relating to the FX & Emerging Markets, Commodities and Structured Rates Business Units including assisting with new product committees and regulatory reform. Assist with enquiries from regulatory authorities and clients and liaise with legal and compliance professionals and other support areas of the Firm on these matters. Provide input to the execution of reviews of the FX & Emerging Markets, Commodities and Structured Rates Business Units to ensure compliance with relevant Market Abuse and Conduct of Business rules, including assisting with the development of review / test check design, implementation and execution of testing and completion and resolution of action items. Assist with the preparation and delivery of the on-going training programme for the FX & Emerging Markets, Commodities and Structured Rates Business Units on a broad array of Compliance and regulatory issues. Assist in the co-ordination of regulatory audits and visits and follow-up on findings as necessary. Assist with the participation in internal and external industry discussions and assist in the drafting of responses and initiatives from industry associations and regulatory bodies.